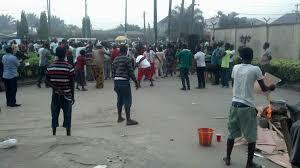 Feelers reaching Fresh Angle International say dare Devil cultists have allegedly killed 10 persons in Agbarho Town, Ughelli North Local Government Area of Delta State and took over major parts of the town. The killings which reportedly took place in “High Tension Right Barrack” along Ekwere Road in Agbarho and other parts of the ancient town, started Monday April 1 and as at 5pm Friday April 5, no fewer than 10 persons were murdered. An eye witness told Our Senior Correspondent that four people were murdered on Monday April 1, while the other six persons were killed between Tuesday April 2 and Friday April 5. The cult group responsible for the gory incident (named unknown as at the time of this report) is reportedly converging at the so called “High Tension Right Barrack” along Ekwre Road in Agbarho in a property said to be owned by one of their leaders. It was gathered that the cultists who operate unhindered, carry dangerous weapons such as guns, cutlasses, daggers and battle axes.